Bacchus is a line of hand built Japanese guitars, represented and distributed by Japan Vintage Guitars. Our featured G-Player Special sells in the $2300 range. The alder body w/quilted maple top includes Gotoh hardware and DiMarzio Virtual Vintage pickups. The Bacchus line includes other S-type models, as well as T-types, J-types, P & J Basses, plus a series of LP body types. 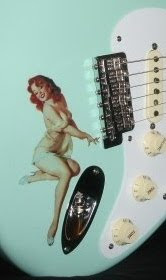 Japan Vintage Guitars primarily handles about six lines of small, hi-end guitar builders. The site content is all English text with US dollar pricing. These folks were selling Fender Japan products to the US market, but that appears to have ceased & desisted.